Understanding how things in the universe work has nothing to do with the question of ultimate origin. I am continually amazed at the number of otherwise intelligent scientists who seem to be confused about this. I read an irritating little article in Newsweek this week: The Godless Particle (by Lawrence M. Krauss, July 16, 2012). Some of you may have heard that recently, physicists have discovered a new subatomic particle. This particle is being called the Higgs particle, because it appears to be the elementary building block of the previously theoretical “Higgs field,” – a force that affects all of matter. This was interesting to me, because I like to read up on astrophysics and cosmology and speculate about how God put together this thing we call the universe. The Higgs field plays a role in how the universe expanded very early in its existence, and possibly in how all matter behaves. However, I was surprised by the Newsweek article, because rather than simply talking about the scientific aspects of the discovery, Krauss went out of his way to argue that this discovery proved the non-existence of God. There are so many logical fallacies in this one sentence it is flabbergasting. I guess this is why I so rarely read Newsweek. The fact that the consequences of the birth of the universe are “accidental” has not been established, and the discovery of the Higgs particle does nothing to establish it. The Higgs field, if it exists, does not preclude an intelligent designer who made it. Krauss says that the Higgs field proves that “Stuff from no stuff” is no problem. Wait a minute. Isn’t the Higgs field “stuff?” Where did the “Higgs stuff” come from? In fact, if it exists, the Higgs field actually demonstrates that indeed, matter in the universe did not come from nothing. The question of where the Higgs Field came from faces exactly the same problem as the issue of ultimate origins always face. Hmm, I don’t remember “quantum burp theory” from college. Anybody? Does the universe have indigestion? What causes a quantum burp? Once again, in trying to dismiss God as the ultimate origin, Krauss completely avoids the actual question of ultimate origin. “For years we have had a theory that there must be some kind of automated fuel delivery system. It was a problem, because we couldn’t find it, and we couldn’t completely explain it. Now we have solved the mystery of how the engine receives fuel, and thereby, we have proved that the car was not created by any intelligent being, but appears to be automatic and self- sustaining; self-creating. That would be a ridiculous conclusion of course. The ancient scientists have made an important discovery about how things work in the car. But understanding how things work has nothing to do with the question of ultimate origin. I am continually shocked at the number of otherwise intelligent scientists seem to be confused about this. Finally there is this. Krauss is arguing that we have just discovered there is no meaning in the universe, therefore humans have made a deeply meaningful stride forward in our understanding. Wait a minute. If all of the universe – and of course, all of human civilization – is random and meaningless, than why does Krauss believe there is any meaning to this discovery of a Higgs particle? The whole discovery – like the whole universe – is just the faint bad smell left over after a burp. It serves no purpose. Both the cause and the result of the burp are random. That means the discovery of the Higgs particle is random and meaningless. That means Krauss is delusional in thinking that it means anything or proves anything. It is like asking “what is six time five?” and then rolling a random number of dice, and saying that the result (whatever it is) must be the true the answer. 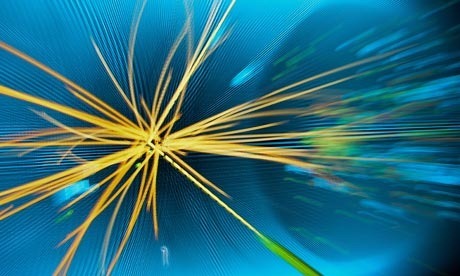 The only way for the Higgs particle to have any meaning is if the universe itself is not random. Like so many scientists, Krauss is confusing science with metaphysics and intelligence with the ability to really think. Maybe it does make sense to attribute his strange conclusions to a random bit of cosmological indigestion. Excellent blog post! You make a lot of sense. Thank you Pastor Tom, having had a Ministry with Atheists, I’m not surprised by their ramblings but saddened, it is not God’s will anyone perishes it is our choice but having been an Atheist myself for many years, I know that many of God’s heart Children are confused by their deception, I was. Thank you for the Light you brought to highlight their darkness.